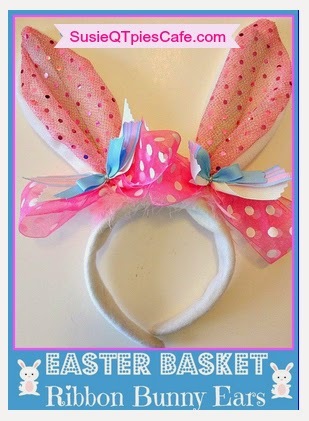 Let's do the Easter Bunny Hop together with these adorable Easter bunny ears. 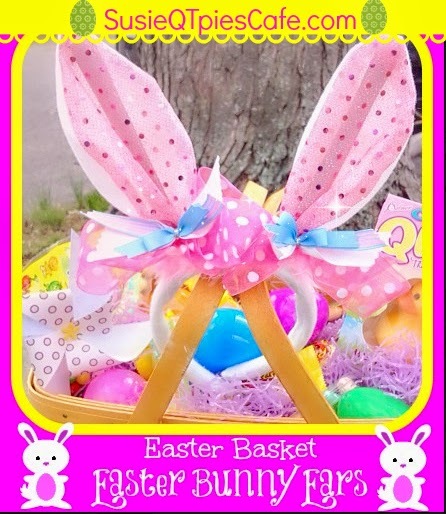 This is an easy Easter craft sure to please any little Easter bunny! I made these last year for my friend's baby! Ok so if you look at the pictures below they were a tad too big but I'm sure this year the bunny has grown into them. What fun crafts do you make at Easter time? Share your ideas! 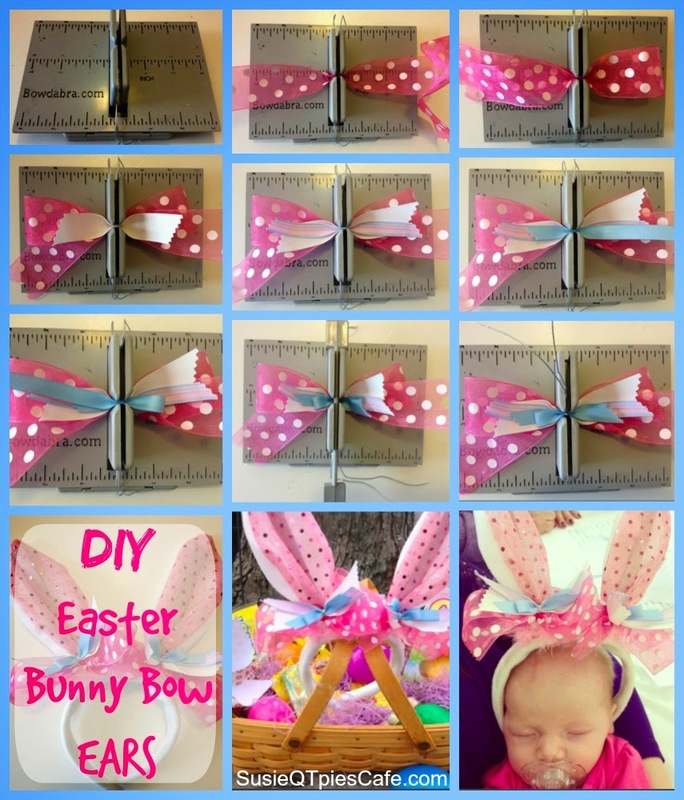 This is a super easy project which I used the Mini Bowdabra to create the perfect bows. If you haven't used this tool, think about getting one! If you like to make bows for any occasion this does it in a breeze. I use to be the worse bow maker in the USA until I got my Bowdabra and Mini Bowdabra! No joke! It is that easy. To use the Mini Bowdabra to make bows, you just do one step at a time and it take all about a minute to make one. Cut a 24" piece of Bowdabra Wire and fold it in half. Then place it in the Bowdabra and wrap the extra wire under each side. Take your ribbon and add 3-4 inches to the left side, scrunch the ribbon in the center. This will be the tail end of the bow. The right side make the same length, loop it over and stick it back into the center of the Bowdabra. Make the loop on the left side, scrunch back into the center and cut the tail to be equal to the left. That easy. Now if you want more to your bow, keep adding more loops instead of cutting off. You can also add strips like I did with the white and pink/blue ribbon. If you add in pieces of ribbon also scrunch it in the middle and make it equal on both sides. I finished my bow with one more looped using the light blue. When done, scrunch the bow down with the Bowdabra wand, bring up the Bowdabra Wire, and loop it together so you can pull it out of the Bowdabra. Turn the bow upside down to knot off. 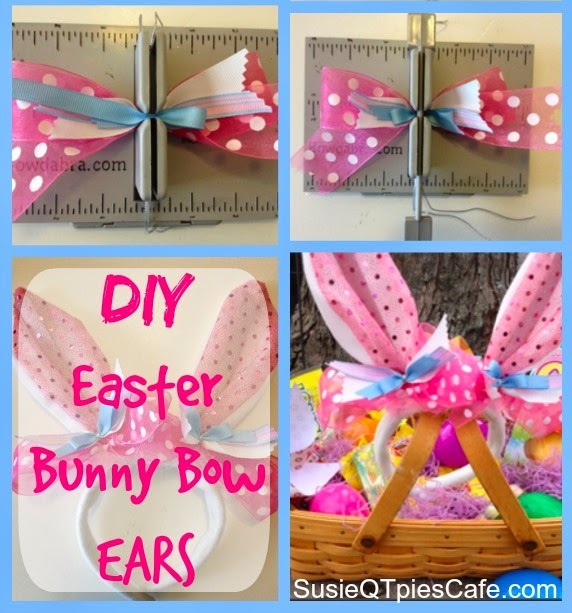 Use the extra wire to wrap on the bunny ears or whatever you want to do with the bow. I then trim the wire when I'm done. Honestly this is easy to do! The Bowdabra site is full of step by step tutorial.